Prices are for 25Kg Drums/Kegs. POA for 200kg/IBCs. Accepta 2336 is a high performance corrosion inhibitor scientifically formulated for the treatment of closed chilled water and low pressure heating systems. Accepta 2336 is based on a nitrite-borate formulation with an additional organic inhibitor added to protect steel, copper and other non-ferrous metals. This makes Accepta 2336 an ideal treatment for closed chilled water and low pressure heating systems. IMPORTANT – Accepta 2336 is NOT intended for use in systems containing aluminium. *Full details of the product properties are available in the Safety Data Sheet. See below. 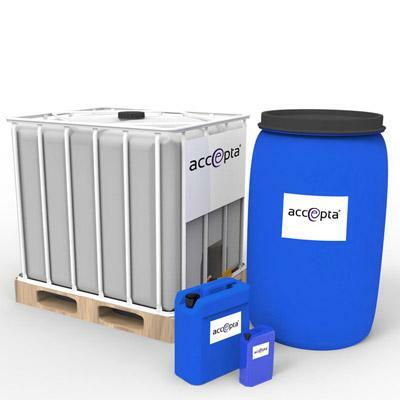 Accepta 2336 is dosed at 5000 – 10000 ml/m3in order to give an active reserve of 1200 – 2000 ppm of sodium nitrite. For further technical assistance concerning Accepta 2336 please contact Accepta.